People say beautiful, succinct, powerful sentiments all the time that I want to remember. I wish I had a pen and a notebook at these times. On occasions I do, but I forget to use them. As a result, I rarely remember the who, but I don’t forget the what. Thank God for Google: it can come in handy for challenges like the one Brad Patterson just urges. What quote “embodies your attitude [towards teaching]and then tells us why”? Wouldn’t you know it, but my mind draws a blank, except for one that I use in various places and always remember, yet cannot find the source. I take it back, Google. I’ve always embodied this sentiment, to a fault. My frustrated parents would ‘ask’ me irritatingly, “why do you have to question everything? !” My response always was “because how do you know it’s right?” I wanted explanation, collaboration, discussion of all possibilities. This quote sounds like something Ghandi or maybe Kant would say, but I can’t prove it. It was hand-written on a random handout I had during my TESL training, spoken by my tutor at the time, referenced to someone I’d forgotten by the time my pen had lifted from the paper. The closest I’ve come to finding it in a book is in Kenneth Bruffee’s Collaborative Learning: Higher Education, Interdependence and the Authority of Knowledge. A good read–I recommend it. It relates to everything I’ve always believed: there is no absolute right or wrong. Everything changes and adapts, even truth. Take beliefs about health over the last 500 years. At one time, if your vision was blurry or you had consistent headaches, you may have been possessed; if you were a woman with abilities beyond what you were expected to have (e.g. you could move a car with your mind…just kidding), you were a witch. Take diets. At one time, stop the insanity was the diet that worked. What does now? Balanced nutrition and exercise? Horse phooey…just kidding. Take teaching. Grammar translation, audiolingualisim, PPP, the lexical approach, task-based teaching, dogme, CLIL—what’s socially agreed upon as the most effective method/approach/<insert term here> changes all the time. People question what is right all the time. We keep discussing it, finding flaws and merits. We don’t simply accept. And this is good. At some point, we build together through experience and sharing what we agree to be our knowledge and we work with this knowledge. Until one day, we question it all over again. And I love this process–one which I try showing the value of to my students. A paraphrase of a quote I found by google. Sums up my approach quite nicely. Nice! Very facilitator-esque and guided-discovery prone! I too have grown up wanting to “find the truth”, and often find that it is a slippery path as there are so many different perspectives, so I know exactly what you mean and what drove your parents (and mine) crazy. 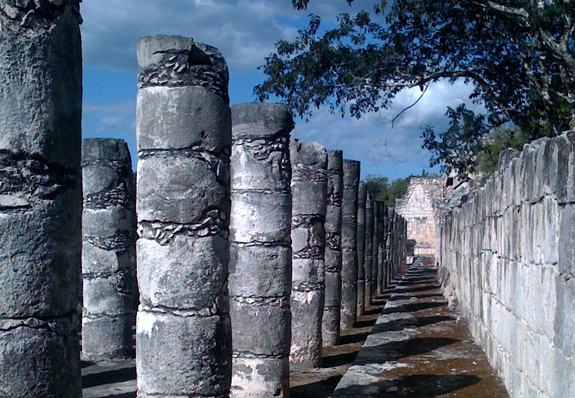 I was on a path to find the truth when I travelled around Mexico for 9 months studying massage and traditional medicine… which took me to Chichen Itza which is the pic your post started with. That culture certainly had a very different truth and it’s fun to imagine what life must’ve been like at that time. Merci 4 the daydreamin’ and philosophizin’. I took that photo and chose it because of the socially constructed knowledge it represents. How distance, shadows and arrangement all represented something spiritual yet provided exact measurements is mind-blowing. Great post – not just about teaching but about becoming mature! My 17 year old sees the world in black and white, but truths aren’t fixed constructs and there are so many shades between black and white! One must constantly readjust in life, it seems! At the risk of being incredibly repetitive – I LOVE this photo too! Thanks, Naomi. I took that photo myself. I loved Chichen Itza.